Scroll down for a list of free days to visit Yorktown Battlefield! In a way, this is where the United States really began. On October 19, 1781, British General Charles Lord Cornwallis and his army were forced to surrender to General Washington’s combined American and French army here. Yorktown Battlefield - Where we showed the Brits the door. And lily-livered Cornwallis didn't take it like a man, either. Let me back up. When we last visited the National Park Service-run site, we started with the 15-minute movie on the siege. Better than most National Park movies, it includes lots of reenacted battle scenes…it’s a must to appreciate the rest of the site. The highlight? Where it shows how British General Cornwallis was so humiliated by his defeat that he basically hid in his tent and sent a lackey to sign the surrender agreement in his place. After the movie, we browsed around the indoor exhibits. They’re small, but include things like George Washington’s camp tent, and a recreation of a portion of an American naval ship of the day, complete with cannons the kids can climb on. Good for a photo op or two. Checking out a ship replica at the Battlefield. At this point, we joined the beginning of a ranger tour describing how the hefty cannons would’ve been fired. After listening a few minutes, Alex, our 5-year-old, was getting antsy, so we ventured outdoors to explore the battlefield ourselves. That’s the nice thing about the ranger tours; you can slip in or out depending on your interest. It was a gorgeous day, just windy enough to keep it cool in the sun. The kids took off running up and down the series of earthworks defenses, dug by both the British and the Continental armies, which wind snake-like throughout the battlefield. 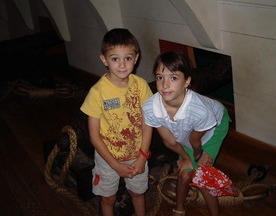 Here and there, they found huge cannons to climb on. The tour road is 7-miles long, but you only need amble along a small portion of that to see the major sites. You can stand on the site where the allied troops mounted a surprise attack on the British, and see the white flag-topped hill where 8300 British troops laid down their muskets and surrendered, effectively ending the American Revolution. If you’re really athletic, a trail connects to the Newport News park trail system for additional biking, hiking, and jogging. 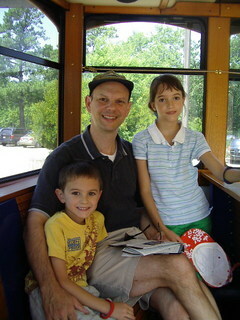 Take the free trolley at Yorktown. I recommend that you do what we did-- take the free shuttle that winds its way from Yorktown Battlefield through the village of Yorktown and some historic buildings to the recently revamped shopping area of Riverwalk Landing. See the tall pillar? The Yorktown Monument to "The Alliance and Victory" was the first monument authorized by the Federal Government. It was authorized October 29, 1781, ten days after the Yorktown victory (but not built until 100 years later…I guess Congress didn’t move any faster back then than it does now). You’ll pass a small but delightful beach where you can sunbathe and frolic on the York River. Or, you can browse the unique shops at Riverwalk Landing. Want a great restaurant? There are several to choose from, including Nick's Riverwalk Restaurant, located on the boardwalk overlooking the river. It has indoor and outdoor seating and a spectacular view of the river and the bridge. But for something really special, I recommend that you make reservations at Carrot Tree Kitchens, located in the Cole Digges House, circa 1720. Read about our family reunion dinner in this quaint, historic cottage... and Carrot Tree Kitchen's delectable Grandma's Chocolate Cake and homemade Carrot Cake. Entrance to Yorktown Battlefield (which covers the visitor center at Yorktown, the battlefield, tour roads and interpretive programs) is $7 per adult (age 16 and older). Siege Line Walking Tours (30 minutes) Walk with a Park Ranger around a portion of the British Defenses and learn about the 1781 Siege of Yorktown. Yorktown Tours (45 minutes) Explore the town of York, established in 1691 as a colonial seaport. Enjoy a walk along Main Street past buildings that have witnessed 300 years of American history, and learn of the town's role in the siege. 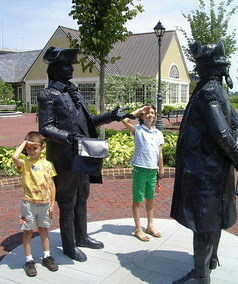 Young Soldiers Program: Join a costumed Interpreter to learn about life as a soldier during the American Revolution. Program includes a hands on activity. The program occurs from mid-June to mid-August. Times for the program will vary depending on staffing. You can enjoy the shops and beautiful views at Yorktown's Riverwalk Landing. National Public Lands Day - end of Sept. Veteran's Day - second weekend in Nov.
For this year's dates, go the the National Park Service site. 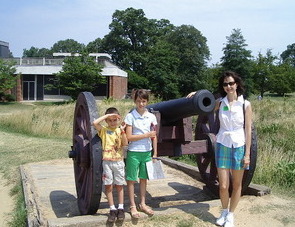 Like all national parks, Yorktown Battlefield offers a Junior Ranger Program for kids 6-12. You buy the book (about $1) from the gift shop and kids have to complete a series of activities (answering questions, getting ranger signatures, etc.) to earn a certificate and a Junior Ranger patch. It’s a good way to get even the most jaded whiner motivated. I know. That used to confuse me too. Basically, there are the cheaper, national park versions and the glitzier, more expensive private attractions. Yorktown Battlefield and Historic Jamestowne are the National Park sites. Yorktown Victory Center and Jamestown Settlement are the private attractions with costumed interpreters and reenactments…but higher admission fees.